If you follow my site on a semi-regular basis, you will know I'm a big believer/preacher of "being patient with your studs." I received a good amount of emails from the panicked owners of Geno Atkins, Sean Lee, and James Laurinaitis over the last couple of weeks asking if they should dump these players. Hopefully these owners heeded my advice and stuck with these guys as all three players had very nice bounce back weeks. Roman Harper, Patrick Willis, LaRon Landry, Patrick Chung, and Cameron Wake were all INACTIVE due to injury last week. Make sure to monitor their status for this coming week. Jo-Lonn Dunbar was re-signed by the Rams this week and figures to see ample playing time on the strong side replacing struggling veteran Will Witherspoon. Bruce Irvin's suspension ended in Week 4 and he will return this week and play in pass-rushing situations. Manti Te'o played just 14 snaps in his season debut, but he notched 3 solos and 2 QB hurries during that time. He could be a fantasy stud if he gets an every down role. Vince Wilfork tore his Achilles' last week and is done for the remainder of the season. Texans ILB Brian Cushing exited Sunday's Week 4 game against the Seahawks with a concussion, but he is expected to be ready for the Texans' Week 5 slant against the 49ers. Charges placed OLB Dwight Freeney on IR with a torn quadriceps, ending his season. T.J. McDonald suffered a fractured leg in the Thursday night game against the 49ers and was placed on short-term IR. The Rams will turn to Darian Stewart and/or Matt Giordano to fill his spot. Cowboys CB Morris Claiborne lost his starting job to Orlando Scandrick. RDE Chris Clemons (SEA) - Clemons returned to action in Week 3 after missing the entire preseason and the first two regular season games as he was recovering from a torn ACL. He failed to register any fantasy points in that game but only played in 16% of the defensive snaps. We saw that percentage jump up to 67% in Week 4 and with it came 5 total tackles and a sack. I'm currently giving him the edge over teammate Cliff Avril as I see slightly more tackle upside. Both players are in the DL3 range for me, but Clemons sits in the higher end of that tier with the potential to leap to the DL2 tier. LDT Marcell Dareus (BUF) - Dareus hasn't put up the eye-popping stats some thought he would after being taken 3rd overall in the 2011 draft. However, he's been a consistent and semi-viable fantasy option in a lot of leagues (especially in DT-required formats) and is coming off a dominant game against Baltimore in which he posted a a 5-2-2 stat line. He draws the Browns this week who have allowed the 3rd most sacks in the league and are first in QB hits allowed. Feel free to place him in your lineup as a DL2-/DT1 this week. LDT Ndamukong Suh (DET) - Suh has gone from being grossly overrated after his huge rookie season to undervalued after two disappointing follow-up seasons. He's played quite well is the first three games of the season but that hasn't necessarily translated to the type of box score production owners were expecting. That said, he was dropped in a ton of leagues last week and he made owners pay with a two sack performance. Judging by his game film, I think Suh has a good shot for a 40/15/9 line. His matchup against the Packers Swiss cheese offensive line this week should help him build towards that goal. LDT Fletcher Cox (DET) - The Giants tend to give up sacks in bunches and I'm banking on that happening this week against the Eagles. If so, Cox has a really good chance at a 1-2 sack game. His performance has been strong enough so far this season to warrant a start this week as a DL3+. WILB Daryl Washington (ARZ) - Washington was an absolute stud last year (100 solos and 10 sacks). He missed the first four games due to suspension this year but now is back and ready for action. In all likelihood, he's been snatched up already in the majority of leagues, but thought I would list him here as a reminder in the off chance he's still somehow available. It's important to note though that I don't foresee Washington coming close to his 2012 numbers; the departure of defensive coordinator Ray Horton and the veteran presence of Karlos Dansby will both temper his production. He's still a low-end LB1, but I hesitant to include him in the elite LB1 conversation for now. WLB Spencer Paysinger (NYG) - The Giants linebacker situation is a complete mess right now and loaded with uninspiring talent, but Paysinger has been playing every down (for the most part) and gets a juicy matchup against the Eagles this week who are allowing the most points to linebackers. He's not an every week starter by any means, but if there was a week to get him into your lineup to cover an injury or bye week, this would be the one. LOLB Ahmad Brooks (SF) - Brooks has stepped up his play this season. With Aldon Smith likely missing "a minimum of five weeks" during his leave of absence to address off-the-field issues, the 49ers will call on Brooks to be their main pass rushing threat. He's a good high risk/reward option in big play leagues as an LB3+. MLB Rey Maualuga (CIN) - I'm admittedly not a fan of Maualuga. He's consistently graded out as one of the league's most deficient linebackers. However, fantasy is about opportunity and situation more so than talent sometimes. That said, Rey has a nice matchup against the Patriots who always serve out a high level of tackle opportunity. Additionally, this is a home game and the Cincinnati scorekeeper seems to have potentially adjusted his methods to include more solos and not as many assists (based off their last home game box scores). If this holds, Maualuga could stick permanently as a LB3+. LCB Buster Skrine (CLE) - Skrine has historically been a solid tackle producer for owners as opposing teams target him frequently during games in attempt to avoid throwing at shutdown corner Joe Haden. He's averaging nearly 5 solo tackles per game and faces off against the Bills this week who have been allowing an elite number of defensive tackle opportunities. DB4+/CB2+. SS Nate Allen (PHI) - Allen's on-the-field play has been quite poor so far this season but the Eagles fast-paced offense has led to a their defense being on the field a lot which has given Allen and company a plethore of tackle opportunity. Additionally, SLB Mychal Kendricks has struggled in run defense which has resulted in more ballcarriers getting to the second level for Allen to clean up. With 23 solos, 8 assists, and a sack in 4 games this year consider him a solid DB3+ as long as he continues to start. SS Morgan Burnett/FS M.D. Jennings (GB) - Burnett was a top 10 DB last season but may have fallen off the radar in some leagues as he's yet to play a game this season due to a lingering hamstring injury. He's resumed practicing this week and it looks like he's going to see his first start of the year this week against the Lions who have been a fantastic matchup for safeties. Six out of eight starting safeties this year have put up more than 6 solos. That said, if Burnett is still available, grab him as he has DB1 potential the rest of the season. Also, Jennings is a nice DB3+/DB2- play this week as well. 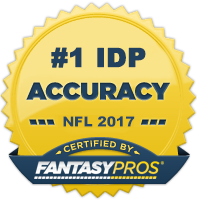 SS Donte Whitner (FS) - Since arriving in San Francisco, Whitner has typically been an IDP that I have avoided for fantasy purposes. But the injury to Patrick Willis and the defense struggling to get off the field more than in recent years has resulted in improved numbers for the former 8th overall pick out of Ohio State. He's had two seven solo performances this year and the Texans matchup this week is one of the best for run-stopping safeties.